Invest in a printer with auto two-sided printing that will keep your business running smoothly — the HP LaserJet Pro M402dn wakes up from sleep mode faster than the competition. This HP LaserJet Pro printer offers several security features to keep your documents safe from boot-up to shut-down. Saving energy is easy with Auto-On/Auto-Off technology that ensures efficient use of power. Use HP Smart app for mobile printing, or easily share resources on your local network with built-in Ethernet. IMPRESSIVE SPEED, SOLID SECURITY – This capable HP LaserJet monochrome printer finishes jobs faster and delivers comprehensive security to guard against threats. HP'S MOST POWERFUL PRINTING APP EVER – The HP Smart app allows you to easily scan documents with your camera and print from social media or the cloud, such as iCloud, Google Drive, and Dropbox. 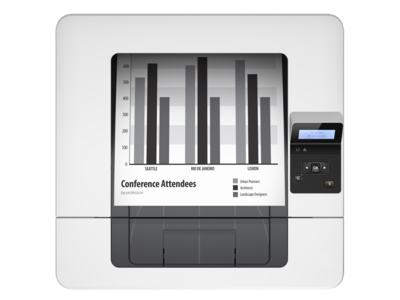 PERFECT FOR THE OFFICE – Get up to 40 pages per minute black and two-sided printing. Recommended monthly volume of 750-4,000 pages. DESIGNED TO CONSERVE – Use a suite of essential features to help you easily manage this power-conserving HP LaserJet Pro printer. It’s built to fit right into your office space and work style. WIDE RANGE OF PAPER SIZE SUPPORT – Letter, Legal, Executive, Envelope #10, Envelope Monarch, Custom size 4 x 6", 5 x 8", 10 x 15" statement. EASILY CONTROL YOUR LASER PRINTER – Manage tasks with the 2-line LCD screen, buttons, and LED indicator lights—plus, save energy with Auto-On/Auto-Off technology. MORE PAGES, PERFORMANCE, PROTECTION – Bring out the best in your HP LaserJet Pro printer. Get reliable performance and outstanding quality using Original HP Toner cartridges with JetIntelligence. ORIGINAL HP TONER: HP LaserJet Pro M402dn uses Original HP 26A/26X black toner cartridges. WHAT'S IN THE BOX – C5F94A HP LaserJet Pro M402dn; preinstalled HP 26A LaserJet Toner Cartridge; Getting Started Guide; Setup Poster; Support Flyer; Warranty Guide; Software CD; Power cord. ONE-YEAR LIMITED MANUFACTURER'S HARDWARE WARRANTY – 24-hour, 7 days a week Web support. ECO-CONSCIOUS CHOICE — has one or more meaningful eco-attributes or eco-labels. ENERGY STAR®, Blue Angel, and EPEAT Silver certified — meets federal guidelines for energy efficiency. Shift your office into high gear with a powerful printer that doesn’t keep you waiting. Print your first page and two-sided prints faster than the competition,1 and help keep your device, data, and documents safe—from boot up to shutdown. 1 Based on HP internal testing of top three leading competitors’ first page out from Sleep mode and duplex print speed completed 8/2015. Subject to device settings. Actual results may vary. For details see http://www.hp.com/go/Ljclaims. Automatic two-sided printing not available for the HP LaserJet Pro M402n.